(KPAX) A new survey by the Chamber of Commerce asked parents how they feel about child-care options in the Missoula area. The results were unequivocal: Child care is too expensive and hard to find. Chamber officials hope that having this data will be the first step toward finding solutions. 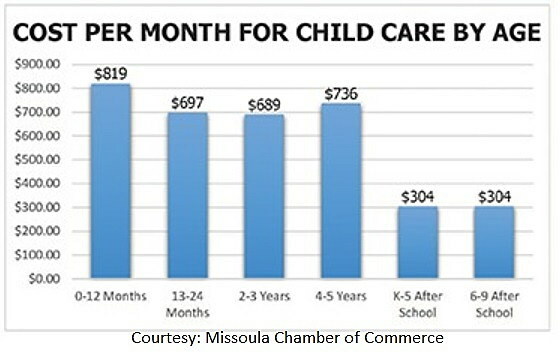 In November, the Chamber released an online survey targeted at parents looking for, and\or using child care services in Missoula. With over 550 responses, the most ever gathered by a Chamber survey, more than 70 percent said they are using child-care centers for children 5 years old or younger. Respondents said they pay an average of almost $638 a month per child, 3 or older, making it their fourth highest expense behind housing, transportation and food. For families with infants, it’s even more difficult and spendy, at $829 a month per child, making it the second highest expense for those families. This combined with the rising cost of living can create the perfect storm for new parents. The average cost to rent a three-bedroom home in Missoula was over $1,100 in 2017, and that combined with child care equals over 50 percent of pre-tax income for families earning the median of just under $42,000 a year. The Chamber estimates that a family would need to earn almost $58,000 a year to afford those two expenses along with other basic needs. To combat this, 47 percent of people who took the survey said they’ve either cut back their working hours, quit altogether, or are planning to do so. Cost was the top complaint, with 82 percent of those polled saying it’s too high. Chamber Director of Government Affairs Clint Burson said his organization’s goal is to raise public awareness, backed up by hard numbers. The next step is working with community leaders to find solutions. “Once we got the data back it shows: It’s super expensive, it’s hard to come by, and people all over the city are looking for child care. So just that public awareness is the first step, and now we start working with community partners. Folks that are interested in finding solutions and looking for ways that we can increase the amount of child care,” Burson said. If you’d like more information about the survey, or would like to help find solutions, contact the Missoula Chamber of Commerce at 406-543-6623.